Lewis G. Cosentino, 87, of Bound Brook, NJ, passed away peacefully on Wednesday, February 6, 2019. He was born and raised in Bound Brook, NJ, and has resided there his entire life. He was a graduate of Bound Brook High School and Rutgers College. He then received his PhD from Columbia University. Lewis was a proud member of the US Navy and Marine Corp for 8 years of active service before being honorably discharged as a Korean War Veteran. 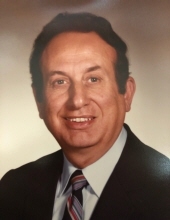 Lewis worked as a teacher for Scotch Plains School District for over 30 years before his retirement in 1994. He was endearingly known as “Mr. Cos” by his students. An avid NY Yankee and Giants fan, Lewis had many interests and hobbies. He was very interested in archery and was a competitive powerlifter for many years. He enjoyed all types of gardening with great harvests of figs, tomatoes, and grapes. He had a keen interest for fitness, nutrition and holistic medicine. He developed a wealth of knowledge in these areas which he used to help many family members & friends. Lewis also loved animals and was very proud of his cocker spaniel champion show dog, Cleo. Lewis was a generous supporter of charities such as St. Jude Children’s Hospital and the Disabled Veterans. He was also a patron of the Metropolitan Opera in New York, the Sierra Club and a member of St. Joseph’s Church in Bound Brook. He participated in many other cultural and artistic endeavors. He was a true Renaissance Man. Most importantly he cherished spending quality time with his family. He will be missed tremendously by all who knew & loved him. He is preceded in death by his beloved parents, Lucy and Augustine Cosentino; two sisters, Angela Papa and Theresa Martelli; three brothers, Gregory, August, and Francis. Surviving are his loving sister Mary DeRosa of Middlesex, NJ; his godsons, Philip Duca and Frank and (wife Debbie DeRosa); and numerous nieces and nephews. Viewing will be held Monday, February 11, 2019 from 9-11am at the Branchburg Funeral Home 910 US Highway 202 South, Branchburg, NJ 08876. Funeral services will start with a prayer at the funeral home at 11:00am followed by an 11:30am funeral mass at St. Ann’s R.C. Church in Raritan. Entombment will follow at St. Bernard’s Cemetery Mausoleum in Bridgewater. Memorial contributions may be made in his memory to St. Jude Children’s Research Hospital 501 St. Jude Place Memphis, TN, 38105. To send flowers or a remembrance gift to the family of Lewis G. Cosentino, please visit our Tribute Store. "Email Address" would like to share the life celebration of Lewis G. Cosentino. Click on the "link" to go to share a favorite memory or leave a condolence message for the family.